The Gala Casino in Edinburgh is now 'The Grosvenor Casino'. Previously part of the prestigious Gala Coral Group, the casino is a great option for a night of entertainment. Located in South Maybury and situated very close to bus stations and the A8, the casino offers multiple entertainment options so you always have something to do. For starters, you can sit back and relax in the Air Lounge, where you can watch your favourite sporting action live on big plasma screens while you enjoy a drink. If you want a piece of the action, check out the many gaming areas including the card rooms that regularly host Poker games, Kalooki and Mah Jong. Or you could try your luck with one of the 20 slot machines in the Jackpot Zone which has the very latest in £4000 jackpot slot machines and other electronic games or even play on the electronic roulette games on your own screen in the Club Lounge area. The casino offers American Roulette, Blackjack, 3 Card Poker, Electronic Roulette and more. Gala can cater to group parties and has special corporate rooms which can be hired for the evening. No membership is required to play or dine at Gala and the dress code is casual. 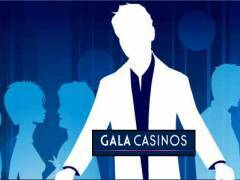 Guests could register for the Fortune program which is valid across all Gala Casinos in the UK. This means, wherever you are, you can still earn points on gaming, food and drink and redeem them at any Gala Casino. The Gala Casino opens at 12 noon and closes at 5am. The Gala Casino restaurant offers a superb A La Carte menu with favourites such as Beef al Porto, Venison Wellington and the Dover Sole. The restaurant also offers a 2 course lunch for only £8.95 which is served from Monday to Friday from 12 noon till 4pm. The bar has a relaxed atmosphere and is just the place to hang out with friends and boasts a great selection of wines, spirits and beers. The cocktails are definitely worth a try-out and are a great value for money. Gala offers special meeting rooms for corporate functions - just speak to the management at the casino and they will work out the best package that suits your budget. There is a lot going on at Gala - from ladies nights, to live entertainment, to special lunches, hen and stag night celebrations, special promotions and more.